Wanted to holler that I pinged back to your marshmallow post in last night’s foodforfun. Hope you get some traffic because of it. Was impressed with how “seriously” (wrong word, I know–marshmallows are not serious) you took your marshmallow making. I’ve found them to be fun projects for sure. Carry on with the candy! 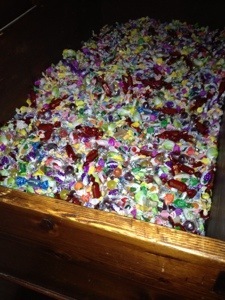 That was a real candy bowl with delicious Italian hard candies, thanks for pinging my post! so you could just reach in and grab a handful? sounds awesome! You almost want to dive straight into that tub! !